Link TV is an American TV channel, that was launched in December 1999, on DIRECTV, EchoStar's DISH Network, and now it available on cable with some cities. 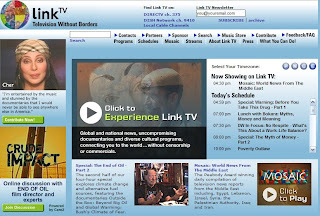 Link TV has an internet TV program site, that provides a unique perspective on international news, current events, and diverse cultures, presenting issues not often covered in the U.S. media. Link TV try to change American viewers whom get information only from U.S. main media that uses one voice for all, and shows you skin-deep comments for different countries, culture. I do like this kind program, you can learn more knowledge from different culture. If you like you can visit Link TV online, and watch different programs. I think it will be great for young people.